Learn the concepts of Chinese ink art and explore brush painting techniques in a relaxed and enjoyable setting. Chinese brush painting also provides a wonderful opportunity to closely observe nature. 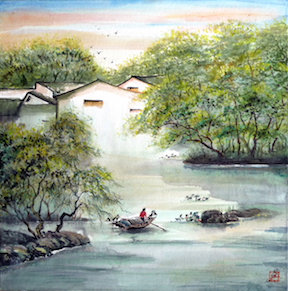 One of the important factors contributing to the evolution of the distinctive style of traditional Chinese painting has been the close relationship between the materials used and their influence on artistic forms and techniques. In this workshop we will learn a simple composition of Southern landscapes. Each technique is demonstrated by the instructor and students receive individual attention adapted to their particular skill level and interests. Beginners are welcome. Click here for a supply list. Welcome all levels.